Grilling adds tremendous depth of flavor to foods and is a wonderfully tactile way to heat food; the direct application of food from fire to plate is thrilling. However, when rain threatens to douse your dinner, grillers need to work in a new direction. 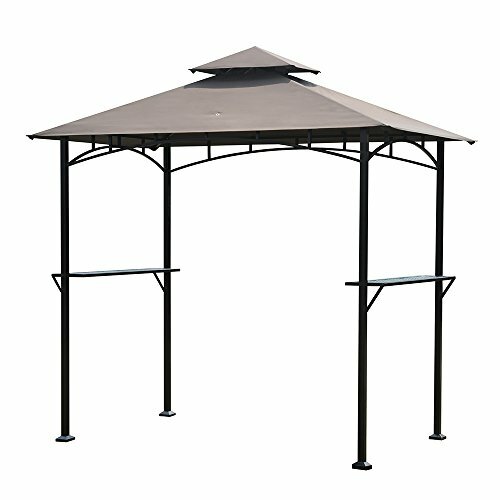 Our favorite option is to use a bbq canopy or large patio umbrella, though it may become discolored over time. The easiest way to grill in the rain is to work with an umbrella that completely covers both the cook and the grill. However lightening is our biggest concern and this may lead to serious injury or death. If you have an overhang or open-sided carport, such a shelter could make grilling possible no matter how heavy the rain is. The down side? It could potentially set your carport on fire. If you're cooking over open charcoal, rain will definitely impact your grilling plans. Those with lidded grills will certainly be slowed, but with the lid down your grill will at least hold the heat. You will need to keep the grill lid dry to protect it from cooling down. If you're planning to grill and it's raining or threatening to rain, some pre-planning can prevent a disappointing grilling experience. Start early and be prepared to cook hotter. If this means you need more charcoal or another gas cannister on stand-by, make that investment. Adjust your food choices so you can grill smaller cuts of meat and smaller packets or pieces of produce. Rain will cool your grill. Gusts of wind can also impact the amount of heat you're able to get to build up. Rainy days are probably not great days to cook a whole chicken or turkey because delivering the heat necessary to your food may be next to impossible. As best you can, work with smaller cuts of meat or produce, keep the fire hot and always use a thermometer! Many fans of winter grilling recommend setting up a temporary windbreak of plywood or other easily movable material to keep your grill from being negatively impacted by wind gusts. Turning the grill perpendicular to the wind can also lessen the impact of heat loss because of wind. Is it safe to grill in the garage when rain messes up your plans? No! Charcoal grilling materials release carbon monoxide when burned. Per grilling authority Derrick Riches, charcoal grills should never be used in a covered space that does not have constant airflow. Your garage, even with the door open, is not a safe place to grill. A carport with open sides would provide more airflow, though the roof may darken and grow sooty. While gas grills generally don't produce visible smoke, grilling in garage with door open is just as unsafe with gas as with charcoal. Depending on your grill, there may be power cords involved as well as fire. While many patios have covered outlets for safe power access, if you're running extension cords out to power up the hopper on your pellet smoker, for instance, make sure to use one long cord, rather than having several connections at risk of getting wet. There are grilling disasters much worse than a rainy day, so be prepared to stay with your grill no matter the weather. Per Deborah Kotz with the Boston Globe, unattended grills can cause catastrophic fires when left unattended. Stay vigilant, and keep the lid of your grill covered. Grilling in the rain can be an adventure, and if you see it that way, the whole project can be memorable and fun.